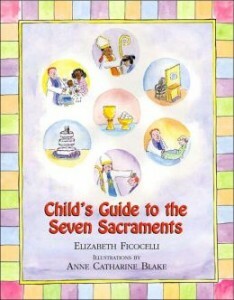 Paulist Press | Hardcover — Child’s Guide to the Seven Sacraments is a children’s picture book aimed at Catholic children in early grade school. It presents the seven sacraments in simple and understandable terms, based on the truths of the Catechism. Each sacrament is referenced to its origin in Scripture and is presented in a way the child might experience it today. With charming color illustrations and interactive questions, the book is entertaining and informative to both child and adult. Understanding Catholicism for Kids! I bought this as a gift for my nine-year-old who was making First Holy Communion. He read it right away and the next thing I knew, my six year old had read it too. Both found it very easy to digest. It also makes a great gift from a Godparent to a Catholic child. This book just won First Place in the children’s book category in the annual awards from the Catholic Press Association. As Elizabeth’s editor, I’m naturally biased and love the book, but I thought potential readers would like to know about this objective, third-party proof of her talents. My children read this book several times each, and now it has become, along with Child’s Guide to First Holy Communion and Child’s Guide to Reconciliation, our family’s gift to anyone preparing for their sacraments! All three are fabulous and should be part of all elementary religious education programs.